Increase the number of Aboriginal patients referred to the Integrated Care for Chronic Conditions Service with post cardiac diagnosis from 3 to 30, by 30 June 2019. In addition, 50% of patients will be engaged in a culturally appropriate cardiac education and exercise program by 30 June 2019. Reduces unplanned hospital readmission rates and hospital length of stay. Improves health outcomes and access to care. Improves patient knowledge of their condition, risk factors, lifestyle modifications and treatment. Provides safe, inclusive and culturally-sensitive care. Builds long-term collaborative relationships with patients and families through trust and credibility. Provides cultural and professional mentoring support. Enhances collaboration with Aboriginal and community health services and fosters key stakeholder partnerships. Creates community ownership and sustainability. Fosters health equity for all across a spectrum. 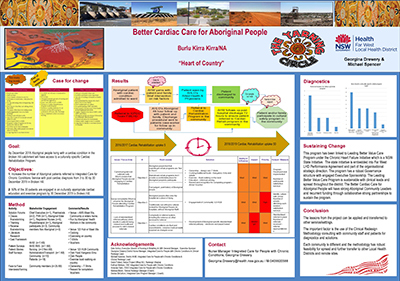 Prior to the project implementation there was no cultural specific Aboriginal Cardiac Rehabilitation program in the Far West Local Health District. The need was identified as there was poor attendance and completion by Aboriginal people with the current mainstream program at the Broken Hill Health Service. Data collected from the cardiopulmonary rehabilitation program indicated that there was a significant gap between Aboriginal and non-Aboriginal participants attending the program over the past five years. The data showed that more than 450 non-Aboriginal participants attended, compared to three Aboriginal participants. The 28 day re-admission data and length of hospital stay following a cardiac event or surgery for Aboriginal patients, was impacting patient outcomes and experience, and increasing organisational costs. The project team developed a partnership with Compass Housing and the Broken Hill TAFE to develop the following strategies. Individual patient education on disorders, risk factors, lifestyle modifications, and treatments. Providing self-management strategies to help patients manage their own health care. A simplified referral process through care pathways and electronic referrals to the program. Nursing education on cultural competency and safety strategies on why to refer to the program. Mandatory cultural awareness training for staff. Incorporating the Better Cardiac Care for Aboriginal People Program into orientation training for new staff including junior medical officers. All program resources are available for adoption or adaptation, by other services and local health districts. The project can be extended to other Local Health Districts. Diagnostic: 15 April to 16 May 2018. Implementation: December 2018 to December 2019. Evaluation and sustainability: June 2019 and December 2019. Broken Hill Health Service and Community. A referral flow chart will be completed for both acute and primary care services. Emergency department and in-patients will be referred to the program through the heart failure pathway and electroniuc medical record the Integrated Care for People with Chronic Conditions Service. This will be monitored and evaluated by the number of referrals received to the Integrated Care for People with Chronic Conditions Service team. A culturally safe venue has been identified by community members and an agreement to use the facility for the program is in place. Outcomes will be assessed by the number of people attending each session and the number of patient satisfaction and experience surveys completed. Cultural appropriate program – evaluation of the program will collected through patient and family experience, and outcome measures. Be flexible, as goals and objectives may change following the diagnostic phase with community and staff. It takes time to engage other Aboriginal services. Consultation and engagement is important for stakeholders to understand the ‘why’ of the program and what their role is as a collaborative partner. The most disengaged stakeholders may become the most engaged in time. Mobilising the executive sponsor, reinforcing sponsors and change champions to embed change is important. Community collaboration and ownership is key. Australian Institute of Health and Welfare. Better Cardiac Care measures for Aboriginal and Torres Strait Islander people: second national report 2016, related material. Canberra: AIHW; 2016. Dawes K, Punch A, Winters M, et al. Implementing a working together model for Aboriginal patients with acute coronary syndrome: an Aboriginal Hospital Liaison Officer and a specific cardiac nurse working together to improve hospital care. Australian Health Review. 2014;38:552-556. DiGiacomo M, Thompson S, Smith J, et al. ‘I don’t know why they don’t come’: barriers to participation in cardiac rehabilitation. Australian Health Review. 2010;34:452-457. Powell R, McGregor G, Ennis S, et al. Is exercise-based cardiac rehabilitation effective? A systematic review and meta-analysis to re-examine the evidence. BMJ Open 2018;8:e019656. doi: 10.1136/bmjopen-2017-019656. Shepherd F, Battye K, Chalmers E, Bala M, et al. Improving Access to Cardiac Rehabilitation for Remote Indigenous Clients: 6th National Rural Health Conference Canberra, Australian Capital Territory, 4-7 March 2001. Turner B. Addressing the Burden of Disease: A structured Cardiac Rehabilitation Program, Abstract Rural Health and Research Congress Armadale 4-6 November 2015. Walsh W, Kangahaan N, et al. Cardiac care for Indigenous Australians: practical considerations from a clinical perspective. MJA, 2017(1);201 Narrative review p. 40-45. Worall L, Daws K, Rahman MA, et al. Exploring Aboriginal patients’ experiences of cardiac care at a major metropolitan hospital in Melbourne. PubMed Database Syst. Rev. Australian Health Rev. 2016 Jan;40(6):696-704.